Stainless Steel Pressure Gauges Headhunter glycerin filled stainless steel pressure gauges provide reliable and accurate pressure monitoring. 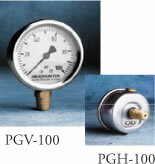 A quality gauge is important for proper installation and trouble shooting of all water pressure systems. Available in vertical and horizontal mount with 1/4” MPT connection. 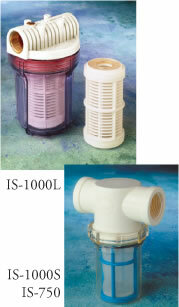 High Flow Water Filters High Flow Water Filters keep your fresh water free of odors and contaminants. These filters are designed to handle the delivery capacities of our Headhunter water pressure systems. 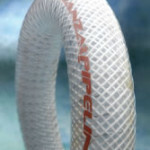 They are available in 304 or 316 stainless steel construction with either flanged or NPT pipe connections. 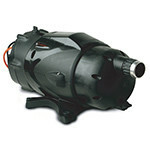 The supplied unique high-performance extruded carbon cartridges are optimized for applications where they replace both the sediment and activated carbon filters. The cartridges also insure that there won’t be any carbon particulates in the water system as is common with granular activated carbon filters. 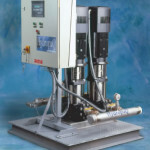 * Specify 304L or 316L Stainless Steel at the end of part number when ordering Consult Headhunter for higher flow rates Ultraviolet Sterilizers These high quality Ultraviolet Sterilizers offer a simple approach to disinfection of potable water on board. They feature 316 stainless steel construction and come in a variety of sizes to match the delivery capacity of your Headhunter water pressure system. All sterilizers also incorporate a wiper mechanism to clean the quartz sleeve without interrupting operation. The easy change bulb system enables effortless lamp replacement without shut-down of water pressure or drainage of tank.